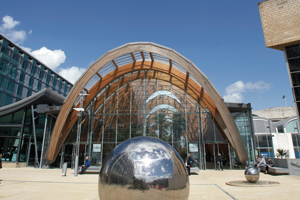 C&IT compares the conference and incentive offers of Sheffield and Doncaster. The Mercure St Paul's Hotel & Spa is Sheffield's largest hotel-based conference and banqueting facility. The latest addition is the 158-room Copthorne Hotel Sheffield, while the 90-room Leopold is the city's first luxury boutique hotel. Sheffield International Venues manages 13 venues, including the 2,000-capacity Sheffield City Hall. Magna, a converted steelworks, has hosted events for Asda, Argos and L'Oreal and The Millennium Gallery is an unusual city centre venue. The Copthorne Hotel's 100-seat 1884 restaurant has won numerous awards, while the Old Vicarage is Sheffield's only Michelin-starred restaurant. The Milestone gastropub champions local produce and can organise group cooking demonstrations. Sheffield International Venues offers a night golf package at Beauchief Abbey with lit fairways. Delegates can go giant ice cube curling at Ice Sheffield or compete in gladiator-style competitions at the English Institute of Sport Sheffield. The Crown Hotel is a transformed 18th-century coaching house 20 minutes from town with meeting space for 200. Mount Pleasant Hotel is a mile from Robin Hood Airport and has six dedicated conference rooms, catering for up to 250. Doncaster Racecourse and Exhibition Centre has had a £34m redevelopment, Doncaster Dome can accommodate up to 1,850 delegates for a meeting or 3,000 for a reception, and the Keepmoat Stadium has banqueting facilities for 450. Nordest, Doncaster's leading restaurant, serves an Anglo-Italian menu and has an upstairs dining area and downstairs lounge that groups can use. At Zest Bar and Grill, diners can select their choice of meat or fish to be cooked to order. Groups can take part in an environmental day at the 200-hectare Potteric Carr Nature Reserve, learn to climb at Doncaster Dome or take part in activities such as horse trekking, mountain biking or speed boating in the Peak District.